The Minnesota FFA Foundation is pleased to announce the presentation of the official FFA jacket to 10 members of the Springfield FFA Chapter. Haley Runck, Caleb Hauger, Lilly McCone, Zack Hensch, Danny Bryer, Jayce Wright, James Coffland, Preston Moen, Connor Scholten, and Logan Richert were selected to receive their own jacket. These students will wear their jackets, proudly representing Springfield FFA, as they compete in career development events and attend various leadership conferences. They are each looking forward to many adventures in their new jacket. “The jacket is a symbol of tradition and pride for those who have worn the official FFA jacket. 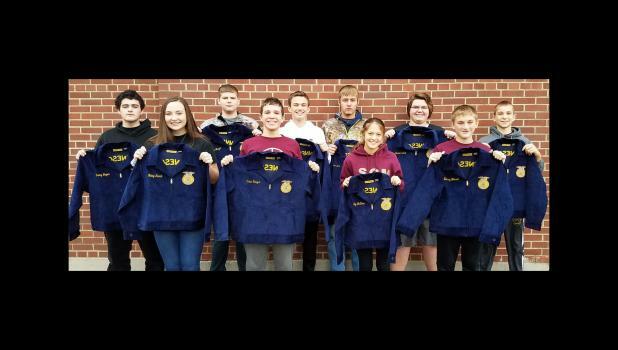 Many past members have sponsored jackets, but it’s not uncommon for individuals and companies to sponsor jackets because they appreciate what the organization does to develop young leaders,” says Val Aarsvold, Minnesota FFA Foundation Executive Director. For more information about the Minnesota FFA Foundation’s Blue Jacket Bright Futures program, contact Program Coordinator, Amanda Sommers, at 507-461-2214 or visit our website at www.mnffafoundation.org. The Minnesota FFA Foundation partners with individuals and businesses to provide resources that promote and enhance premier leadership, personal growth and career success for Minnesota youth in Agricultural Education.